The XX09 series of antennas is based on the success of the predecessors 4003 and 4006 with all new electronics and sophisticated shock and vibration isolation. They have done away with the mechanical level cage and incorporated a solid state equivalent inside the PCU. The antenna comes with a tuned radome for minimum attenuation. The most standard version is the 4009-33 co-pol/xpol version complete with 2 quad LNBs and a 8Watt Codan BUC. It is available in other configurations as well, but might take a little longer to order. Note the wire rope isolators at the base of the antenna, the vertical isolation spring and the large pneumatic shock absorber on the right hand side. These antennas are designed for the worst sea and vibration conditions. 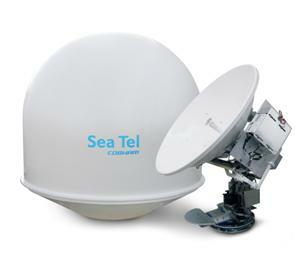 The new SeaTel 4009, 1.0 Meter Ku band VSAT antenna has been designed and tested to meet the most demanding sea state conditions. Based on the industry leading 4006RZA , the 4009 has improved above deck electronics in two housings. The level cage (the heart of the stabilizing system), now has no moving parts and is housed inside one of the modules. It has significant improvements in vibration and shock dampening with a pneumatic shock absorber. It has an improved, tuned radome for significant RF improvement. The radome diameter is a few inches bigger, but matching radomes are available for the XX04 TVRO series for aesthetically pleasing symmetrical dual antenna installations. • Transmission rate is compatible with many different types of modems, networks and services. • IP access to the internet and corporate networks enabling fast downloads of large data files and e-mail. • Brake system on EL and CL axes tp prevent damage due to loss of power. • Efficient spectral use maximizing cost per bandwidth. • Easy Stand-alone or network compatible installation. • 24/7 customer care and technical support. Ku-Band satellites operate in the 12-14 GHz band and provide spot beam, or regional coverage to certain areas on the earth. They require smaller, 1 meter, VSAT antennas and provide more economical coverage to vessels that operate in a particular region for some period of time. When the vessel relocates, it will need to change to a different satellite and a different satellite beam. Only high traffic areas are covered with Ku-Band, with the first Transatlantic beam becoming available in 2009. Vessels that require more seamless coverage in less trafficked areas would need C-Band service. 28080 visits to this page since 28 Nov 2012.